* UART 2 is shared with the RX, UART 3 Can be used without SDCard and a pin remap. ** Combined 5v and 3.3v load can not exceed 2.5A. This board can be ordered from OSHpark. Use this file to create a Top Stencil from OSH stenciles. Use this file to create a Bottom Stencil from OSH stenciles. The BOM can be found here and downloaded here. The Schematic can be downloaded here. The Top Board Layout can be downloaded here. The Bottom Board Layout can be downloaded here. The pinout can be downloaded here. Attribution NonCommercial NoDerivatives 4.0 License. AlienFlightNG was created after Lance moved his focus to other things a while ago. Lance took with him the results of his and Michael’s common work on the AlienFlight F4 controllers which had not been released at this point in time. Michael wanted to continue with the ideas of very unique flight controllers for small brushed and brushless multicopters. Gary joined up with Rob and Michael to create the initial team for AlienFlightNG. 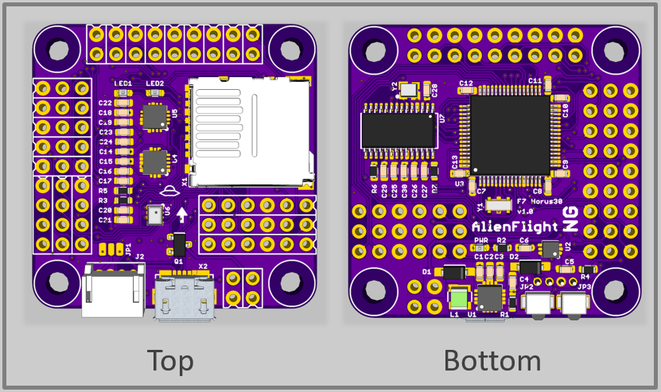 After some general design discussions, Gary created new board layouts from scratch for the first generation of the AlienflightNG F4 controllers and we released these board designs to the public. Basically at the very same time, Lance finally made public the Alienflight F4 designs which had been created back when he and Michael worked together. Our most recent design release is based on the STMF7. This was made possible by many improvements done in the BetaFlight firmware and the general F7 support which was implemented. Michael is part of the development team of BetaFlight and beside some general contributions to the code he also maintains the AlienFlight targets in the firmware (INAV firmware support is in the works too – autonomous Alien?? J). We have so many new ideas which are driven by the current market demands and are working really hard to bring them out as fast as possible. In order to do this we have decided to add a new team member to help with realizing our ideas. Leon recently joined our team to help us with the hardware design and board layouts. This should hopefully enable us to keep up the speed of development and assist us in delivering top notch flight controller designs to you, the end user. We really enjoy seeing people building our controllers, flying them and having fun through our designs. This is mostly the reason we do what we do, and for this we thank you! Building the AlienFlight controllers for private use is encouraged. Please contact us if you have an interest in commercially producing these controllers. We would like to give credits to all contributors to MultiWii, Baseflight, Cleanflight and BetaFlight. The evolution of the firmware development over many years make the AlienFlight boards possible. For the AlienflightNG receiver we like to give our credits to Midelic and Fishpepper for there work on the FrSky compatible receivers. The AlienflightNG receiver hardware is strongly inspired by Fishpepper's uSky project and is using a variant of his OpenSky firmware. Also to Lance for his work on the initial AlienFlight designs. If you feel you should be here, Please feel free to contact us.